I am so behind on reviews! Between reading for school, reading fo r the Cybils, grading, planning, and running the dogs every day, there just isn’t enough time in the day! So I am succumbed to the pressures of my towering to-be-reviewed pile. Over the next few days I will be posting short, Twitter-sized reviews of books I’ve read recently. 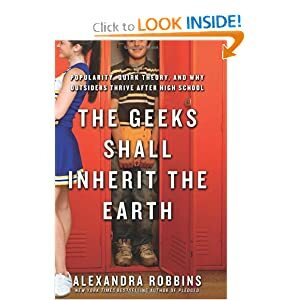 The Geeks Shall Inherit the Earth: Popularity, Quirk Theory, and Why Outsiders Thrive After High School by Alexandra Robbins- An interesting look at high school cliques. Not a huge fan of the choice to include a teacher as one of the subjects (especially as her status isn’t revealed until later in the book). Definitely thought-provoking. 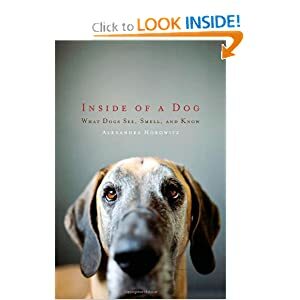 Inside of a Dog: What Dogs See, Smell, and Know by Alexandra Horowitz- I picked this up because I have two extremely intelligent dogs and wanted to know more about animal behavior, specific how the canine brain works. This is a science book that won’t overwhelm the casual reader and I learned some interesting things about how dogs view the world. Recommended for dog lovers- it may change the way you interact with your pet. In the interest of full-disclosure, I went to high school with Brian. We’ve kept in touch and I was so excited when I read his book announcement in Publisher’s Weekly. I pre-ordered the book as soon as I could, and I read it from cover to cover as soon as it arrived. However, I tend not to read a lot of adult NF (other than professional books), so I knew I would be pretty hard on the book- I am tough to impress in the adult NF sector). Named for computer pioneer Alan Turing, the Tur­ing Test convenes a panel of judges who pose questions—ranging anywhere from celebrity gossip to moral conundrums—to hidden contestants in an attempt to discern which is human and which is a computer. The machine that most often fools the panel wins the Most Human Computer Award. But there is also a prize, bizarre and intriguing, for the Most Human Human. In 2008, the top AI program came short of passing the Turing Test by just one astonishing vote. In 2009, Brian Christian was chosen to participate, and he set out to make sure Homo sapiens would prevail. The author’s quest to be deemed more human than a com­puter opens a window onto our own nature. Interweaving modern phenomena like customer service “chatbots” and men using programmed dialogue to pick up women in bars with insights from fields as diverse as chess, psychiatry, and the law, Brian Christian examines the philosophical, bio­logical, and moral issues raised by the Turing Test. One central definition of human has been “a being that could reason.” If computers can reason, what does that mean for the special place we reserve for humanity? As a teacher, I really appreciated The Most Human Human: What Talking with Computers Teaches Us About What It Means to Be Alive. Brian does a fantastic job of bringing together many disciplines- math, science, computers, linguistics, sociology, human behavior, and much more. Brian’s background in science writing and philosophy plus his MFA in Poetry are exactly the type of well-rounded academic life I am promoting to my students. To be a successful citizen of the 21st century, you can’t just be an engineer, or a salesperson, or a teacher. You must make your own way and your own ideas. We are preparing students today for careers that don’t even exist yet! Being well-rounded academically is so very, very important. And being able to bring all those ideas together is imperative. And as a teacher, I appreciate the thought-provoking theme of what makes us human. Our students are moving into an increasingly digital world- what will that mean for humanity? Where do we draw the line? When do computers become “human”? As Brian points out, most human inventions came to be when we had a job that needed to be done. Computers, however, were invented and then we created jobs for them. They’ve always been different, and they are shaping the world we live in today and the world that will exist in the future. This is a book I know I will find myself going back to over and over, rereading chapters here and there. 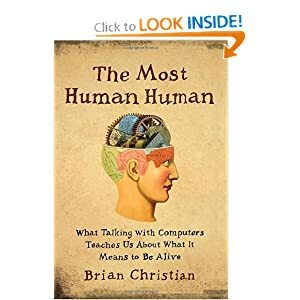 I look forward to discussing it with my students in the fall (The Most Human Human: What Talking with Computers Teaches Us About What It Means to Be Alive is our One Book, One Class for the incoming freshman class). A few of my current freshman have read it and really enjoyed it. And Brian will be coming to speak to our freshman after spring break. I am really looking forward to that! Highly recommended for high school readers and adults. 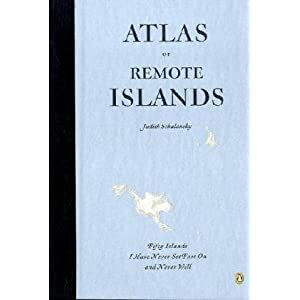 During Christmas break I noticed that Pamela Voelkel (one half of author due J&P Voelkel) tweeted about a book she received for Christmas-Atlas of Remote Islands. My goal in 2010 was to read more nonfiction and to find more nonfiction for my students. I was intrigued by the title and added it to my Goodreads. Plus, my husband is a cartographer and we have lots of atlases around the house. I figured it was about time to add one of my own. Later that week I took a few Christmas gift cards and picked up a copy. What a fun book! Atlas of Remote Islands is an expose, an encyclopedia of sorts, of islands around the world that are still cut off from civilization. The fact that these islands still exist fascinates me. The book is divided into sections, like an atlas, based on geographic area. Each island receives a page dedicated to a cartographic representation of their location and the opposite page with a write-up of the history of the island. The cartography is very basic and nothing to be excited about. The colors are bizarre and actually make it hard to see the maps. But the information about island is what made me love the book. This isn’t a history book, but reads more like a narrative. It’s not Wikipedia- the islands aren’t explained in great detail. Instead, a one-page anecdote is shared. But I will admit I was intrigued by almost every page and found myself googling more information on all of the islands. This is a great book to share with teens. For those who don’t like to read non-fiction, this book isn’t intimidating and reads like a story. Teens will find themselves wanting to know more about some of the islands and may go seek out more information about them. What more can you ask for? The concept of the book is cool and kids will find themselves engrossed in the bizarre stories. One area that my classroom library is lacking in is high interest books for some of my developing readers. No one in 6th grade wants to look like they are reading a “baby” book, but I hate watching them struggle with books that are above their level. Needless to say, I was thrilled when I saw a Capstone Press catalog because they publish lots of fiction and nonfiction that are perfect for middle school developing readers! The Pukey Book of Vomit (Edge Books) by Connie Colwell Miller is perfect for those kids who love to be grossed out. It covers fascinating topics like “How Vomit Happens” and “Upchuck!”. Needless to say, EW! The book itself is a great mix of straight text, graphics, sidebars, and diagrams. Personally, I learned that when you throw up, your stomach actually turns almost completely inside out! Again- Ew. While the subject matter is gross, The Pukey Book of Vomit (Edge Books) is awesome. It’s a big hit with all my boys, who are now experts on puke. How to Survive a Flood (Edge Books) by Matt Doeden taught me a lot about how to stay safe in a flood. Doeden teaches the reader how to survive a flood if you are trapped in a car, if you are caught off guard, and a variety of other situations. Again, the book is full of nonfiction features and the subject matter is perfect for dormant and developing readers. Highly recommended. Carnival of Horrors (Shade Books) by Phillip Preece is perfect for those kids who want to read Cirque du Freak but just aren’t there yet. They love that the cover of the book looks like a middle school book and not like a baby book. But on the inside, there is plenty of white space and the text is perfect for developing readers. The story isn’t that scary, but it’s good enough. The illustrations are creepy, though! Summer of Sabotage by Bob Temple. Again, the cover really sells this one. It doesn’t look like a baby book! In fact, the cover actually creeps me out a little, and I’m the teacher! This is a great mystery about a water park where strange accidents keep occurring. 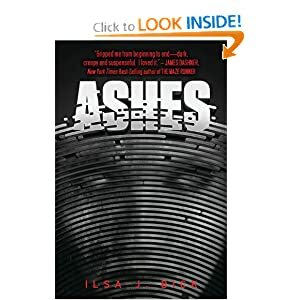 The two main characters are determined to find out who is causing these accidents, though they could easily be the next victims. All of these books are aimed at students in grades 5-9, but they are written at a grades 2-4 reading level. The fiction books aren’t fantastic writing- characters are flat, the stories are predictable (to me). But for developing readers, these are perfect. And honestly, the nonfiction titles are awesome for any elementary or middle school classroom. Did you know that a platypus is poisonous? In fact, they are the only poisonous mammals. I had no idea! After reading Steven Jenkins’s Never Smile at a Monkey: And 17 Other Important Things to Remember I know that and much more. Right now, the Worst Case Scenario books are very popular in my classroom. Never Smile at a Monkey: And 17 Other Important Things to Remember is the perfect book to pair with them. Jenkins’ illustrations are always stunning and that doesn’t change in his latest nonfiction book. While the book is supposed to be aimed at younger readers, I know my middle schoolers will love it. I think it will also serve as a great introduction to some species they are not familiar with. Hopefully, that will then lead to more research on their part. I mean, I learned a lot from this book! I had no idea cobras aim at the eyes and can spit venom accurately from over 8 feet away. Holy cow! I also enjoyed the afterward at the end, which gave more in-depth information on all of the animals. It seems to be a standard middle school project- choose a hero and write a report about them. Sure, the product may vary- report, triboard, slideshow, website, multigenre project- but the assignment rarely varies. And what always happens? Teachers end up with 32 projects on the same 3 people. Every. single. year. 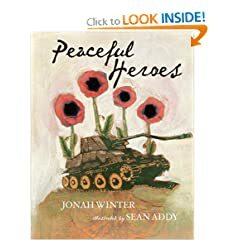 For that reason, I can’t wait to add Peaceful Heroes to my classroom library. This slim volume simplifies the biographies of 14 peaceful heroes throughout history. While a few are well-known, like Martin Luther King, Jr., most even I was not familiar with. The stories are brief, about 2-3 pages, but they give just enough information to intrigue the reader. Each heroes chapter focuses on what made them a hero, with some brief background information. I think this is the perfect book for students who don’t want to choose the same old person to research but also have no idea how to find anyone else to research. Peaceful Heroes is the ideal introduction to people like Oscar Romero, Meena Keshwar Kamal, and William Feehan, all of whom risked their lives to make our world a more peaceful place. I myself was inspired to look up more in-depth information on a few of the men and women featured. A great addition to any middle school library, and especially valuable to social studies/history teachers. As I mentioned this past summer, I am teaching an elective this year that focuses on the migration of the monarch butterfly and specifically on Meso-America and the Meso-American people. I read Charles C. Mann’s adult nonfiction title, 1491, over the summer and loved it. Needless to say, I was thrilled when I learned he had adapted the information for a kid’s nonfiction title! Why did the Europeans succeed? In answering these questions, you are taken on fascinating and compelling journey. Even though I have been studying the area (and visited central Mexico), I found myself learning new information. The book includes stunning photographs, paintings, maps, and other non-fiction features that further supplement the text and bring the facts presented to life. I’ve been sharing various passages with my enrichment class and everyday they leave talking about something we discussed. 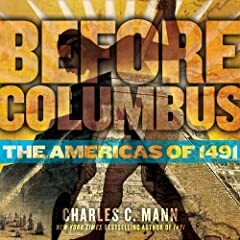 Before Columbus: The Americas of 1491 is highly recommended for middle school and high school classrooms. It is worthy of a place on the most selective bookshelves!